I thought it might be worth presenting a review of how the Experiential Learning Program in Historic Archaeology works at the Johnson’s Island Civil War Military Prison site. Some may wonder if we are concerned with having inexperienced younger students working at this National Historic Landmark site. We have created a very systematic process to guarantee that the archaeological resource is not jeopardized by using students with no previous training. The benefits of having students experience science, history, the Civil War, and archaeology in an actual research setting are seen every day. Click here for student reports and feedback! We begin the day with a visit to the cemetery where we expose the students to how anthropologists think. The first task for the students is to observe patterns of human behavior within the cemetery. Then, the students are asked to formulate hypotheses for their observations. During this process, I read from two primary documents related to the cemetery to add historical data to the information they have to work with in the revision of some of their hypotheses. The students leave the cemetery with newly gained information about the prison site and a mind set oriented towards thinking about cultural material. When the students arrive at the Prison Compound, they are given a quick orientation to the site followed by detailed protocols that they will need to follow in order to insure the recovered artifacts are properly provenienced. As the students enter the excavation area, they are shown the proper excavation techniques (see photo, right). The staff, consisting of three undergraduate senior students from Heidelberg College and one paid experienced staff member demonstrate how to enter a unit, excavate in a level fashion, and place the excavated soils into the proper buckets to take to the screen. The students are then taken out to the screens to learn how to separate the soils from the cultural materials. Students are not allowed to remove anything from the screens except roots and worms. All other materials are either placed into the collection baskets or left in the screen for the staff to determine if cultural. Once the screen has been checked by the staff, it can be emptied and another bucket emptied into the screen. As can be seen from the screening picture, each screen is labeled with a letter A, B, C, or D corresponding to the unit they are investigating. Each unit has its provenience number (a Northing and Easting number) and given a letter designation to make keeping artifacts associated with the unit easier for the students to follow. As students start with their recovery of materials from the site, they begin to work with the unit supervisors. Typically five or six students are assigned to each unit. Three may excavate, and the rest screen. In this fashion, it is easy for the supervisors to monitor all activities that are taking place at the site insuring proper recovery is taking place. We orient the students all in the same direction to assist the staff in assuring the unit is being taken down in a level fashion. Notice the “caution” tape placed at each unit’s entrance (see photo, right) to remind students not to step on the wall and cause integrity issues to the walls of the unit. After materials are brought to the screen, staff works with the students in the identification and recovery of all cultural material. Both prehistoric and historic materials are recovered. 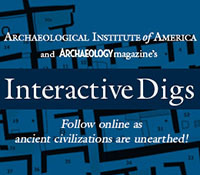 As materials are being identified, the students are working with a “Dig Bingo” board that encourages them to associate the artifact with a human activity, which are the categories on the board. As they find more artifacts, and the bingo board begins to fill, they begin to think more and more about how each artifact functioned within the social context they represent. Certain artifacts are considered “Field Specimens” because of their diagnostic or interpretative value. A 5th grade student (see photo, right) records the recovery of a hard rubber chain link that a prisoner had made for a necklace. As the discover of the artifact, their name becomes associated with the artifact within our archaeological catalogue for the site. After lunch, the students are invited back into the site for diary and letter readings from the guard and prisoners. Not only have students been exposed to the cultural material from the period, they are now able to hear the voices from the past. Our readings are taken from the same date they are at the site, but from 1862-1865. In this way, the subjects that are brought up vary from day to day. At the end of the day’s experience, students gather with the unit supervisor to review all the finds of the day. The materials are separated into raw material categories, counted, and reviewed to insure they have properly identified their function. Students are asked to select one artifact which they have recovered to present to the rest of the class. Here (see photo, below), they get to share what they have learned.